We are living through a glorious age of exploration of our solar system. This particular tool will begin the task of ferreting out a proper map of all significant objects in nearby solar orbit. Obviously we expect to find a lot of material that is worth tracking. I am not nearly so exercised over possible impacts as some because our efforts have shown us that these events are super rare and most everything is nicely managed by Jupiter. It is most likely the reason that Venus does not have a supply of water yet. Mankind’s future task will be to change that, after we are properly finished here. Then we will have two planets to live on comfortably. I am pleased that this protocol will work. I would certainly have expected problems there. The next big push, once we have a source of energy such as the focus fusion device, will be to spread a number of such scopes out into the solar system to form a large globe based initially on Earth’s orbit and naturally able to collect data on the inner solar system inside the orbit of Jupiter. This all will be much sooner than anyone thinks. We have the technology and we have the teams in place to make it happen. It is all waiting for the necessary fusion powered one g thruster. As is also our first manned trip to Mars. Without a one g thruster, exploring Mars with a thousand rovers looks like a wonderful idea and certainly many times more effective. In modern warfare, though, ninjas would be sitting ducks. Their black clothes may be hard to see at night with the naked eye, but their warm bodies would be clearly visible to a soldier wearing infrared goggles. To hunt for the "ninjas" of the cosmos — dim objects that lurk in the vast dark spaces between planets and stars — scientists are building by far the most sensitive set of wide-angle infrared goggles ever, a space telescope called the Widefield Infrared Survey Explorer (WISE). WISE will scan the entire sky at infrared wavelengths, creating the most comprehensive catalog yet of dark and dim objects in the cosmos: vast dust clouds, brown dwarf stars, asteroids — even large, nearby asteroids that might pose a threat to Earth. Surveys of nearby asteroids based on visible-light telescopes could be skewed toward asteroids with more-reflective surfaces. "If there's a significant population of asteroids nearby that are very dark, they will have been missed by these previous surveys," says Edward Wright, principal investigator for WISE and a physicist at the University of California in Los Angeles. The full-sky infrared map produced by WISE will reveal even these darker asteroids, mapping the locations and sizes of roughly 200,000 asteroids and giving scientists a clearer idea of how many large and potentially dangerous asteroids are nearby. WISE will also help answer questions about the formation of stars and the evolution and structure of galaxies, including our own Milky Way. And the discoveries won't likely stop there. "When you look at the sky with new sensitivity and a new wavelength band, like WISE is going to do, you're going to find new things that you didn't know were out there," Wright says. Stars emit visible light in part because they're so hot. But cooler objects like asteroids emit light too, just at longer, infrared wavelengths that are invisible to the unaided eye. In fact, any object warmer than absolute zero will emit at least some infrared light. Unfortunately, this fact makes building an infrared telescope rather difficult. Without a coolant, the telescope itself would glow in infrared light just like all other warm objects do. It would be like building a normal, visible-light telescope out of Times Square billboard lights: The telescope would be blinded by its own glow. To solve this problem, WISE will cool its components to about 15°C above absolute zero (or -258°C) using a block of solid hydrogen. 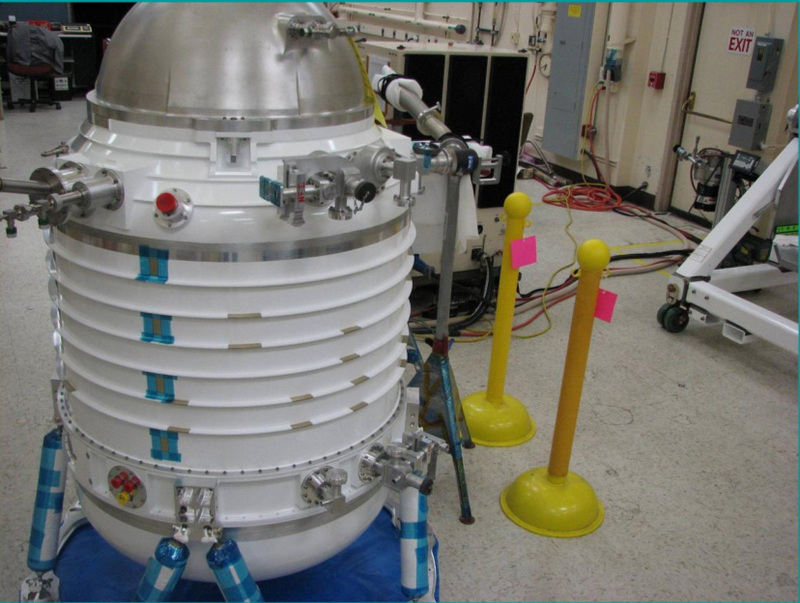 Mission scientists chose solid hydrogen over liquid helium, which is often used in research for cooling materials to near absolute zero, because a smaller volume of solid hydrogen can do the job. "The cooling power is much higher for hydrogen than for helium," Wright explains. When launching a telescope into space, being smaller and lighter saves money. Previous space telescopes such as the Infrared Astronomical Satellite (IRAS) have mapped the sky at infrared wavelengths before, but WISE will be hundreds of times more sensitive. While other missions could only see diffuse sources of infrared light such as large dust clouds, WISE will be able to see asteroids and other point sources. 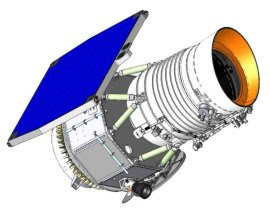 After it launches into orbit as early as this December, WISE will spend 6 months mapping the sky, during which it will download its data to ground stations 4 times each day. Analyzing that data should give scientists some new insights into the cosmos. For example, one theory posits that most of the stars in the Universe were formed in the press of colliding galaxies. When galaxies collide, interstellar clouds of gas and dust smash together, compressing the clouds and starting a self-perpetuating cycle of gravitational collapse. The result is a flurry of starbirth. Newborn stars are usually concealed by the dusty clouds they are born in. Ordinary light cannot escape, but infrared light can. WISE will be able to detect infrared emissions from the most active star-forming regions. This will help scientists know how rapidly stars are formed during galactic collisions, which could indicate how many of the universe's stars were formed this way. WISE will also target dim "failed stars" called brown dwarfs that outnumber ordinary stars by a wide margin. Mapping brown dwarfs in the Milky Way may reveal much about the structure and evolution of our own galaxy. And this could be just the beginning of the discoveries scientists make once WISE puts the spotlight on stealthy denizens of the dark.